Gigahertz-Optik's P-9710-1 Radiometer/Photometer for universal use in any UV - Visible - Near Infrared radiometric and photometric application provides a wide light measurement range, fifteen menu selectable modes of operation, full RS232 remote control (optional Windows based software) plus internal datalogging. The P-9710-2 model light meter features a fast response pulse energy mode enabling on-site measurement of single and multiple pulsed light events down to one microsecond in length. Steady-state light levels or the average energy of flashing light sources, strobe lamps, LEDs, beacons/ warning signals, pulsed Xenon sources can be accurately measured with data storage on site or in the lab. 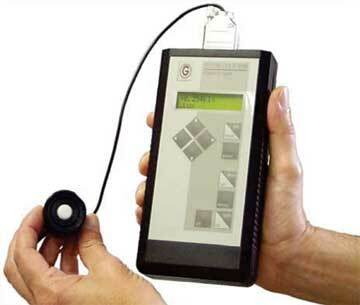 All essential detector data is stored in the detector's connector so that any number of light detectors and associated components like optical filters, integrating spheres, for example, can be interchanged on the one P-9710 Radiometer/Photometer for error free system set-up and operation. This makes adding additional light detectors for future light measurement projects quick and easy. The chief feature of the P-9710 is its versatility. It serves as the read-out device for a full program of UV-Vis-NIR radiometric, photometric light detectors and accessory components. Photodetector, filter and any necessary input component or accessory can be specifically configured for light and LED measurements in any light measurement unit. Your company is installing flashing warning beacons at various sites around the facility. In order to ensure conformance to published safety standards, the pulse energy needs be measured. The measured effective intensity at a set distance should be high enough to warn approaching traffic. As the lone electronics engineer in your facility, management comes to you to handle the project. P-9710 Radiometer/Photometer with VL-3701-2 Illuminance Detector. 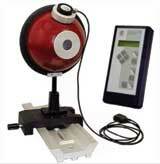 Download the P-9710-1 Radiometer/Photometer Technical Data Sheet pdf file.